We plant more than 10,000 flower bulbs in our trial gardens each fall. That’s a lot of bulbs and it takes more than a week to plant them all, but there’s no better way to evaluate performance, check heights and bloom times, and experiment with mixes and combinations. During April and May, the garden is a riot of color with a ribbon of blue muscari weaving its way from one bed to another. Muscari armeniacum, also known as grape hyacinth, is an ideal companion for both tulips and daffodils — and we plant lots of it. The combinations shown above are some of our favorites. 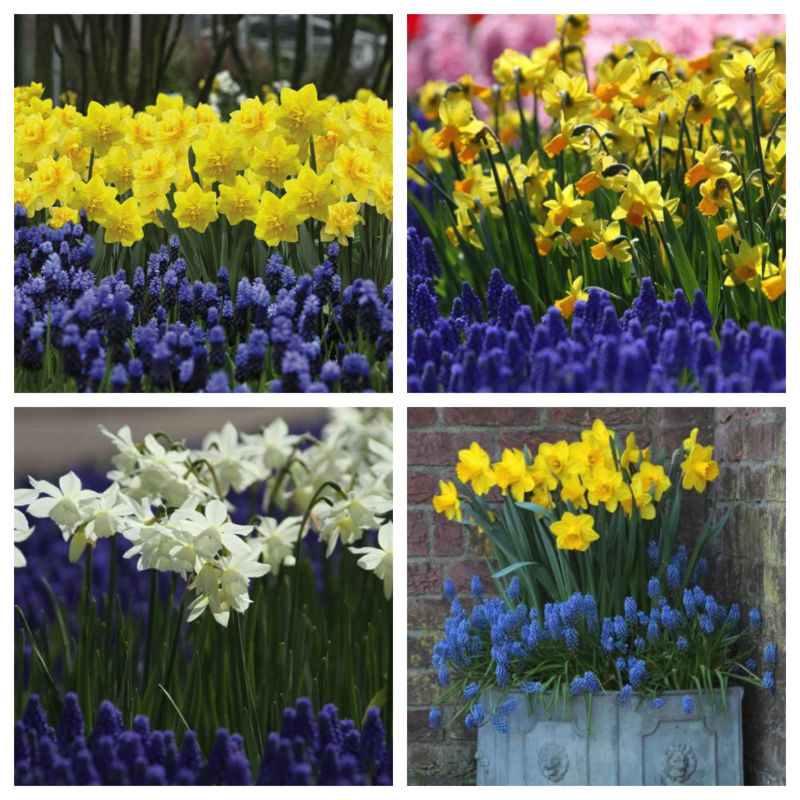 1) If there’s a backdrop and the garden will only be viewed from one side, plant the muscari in front of the tulips or daffodils. 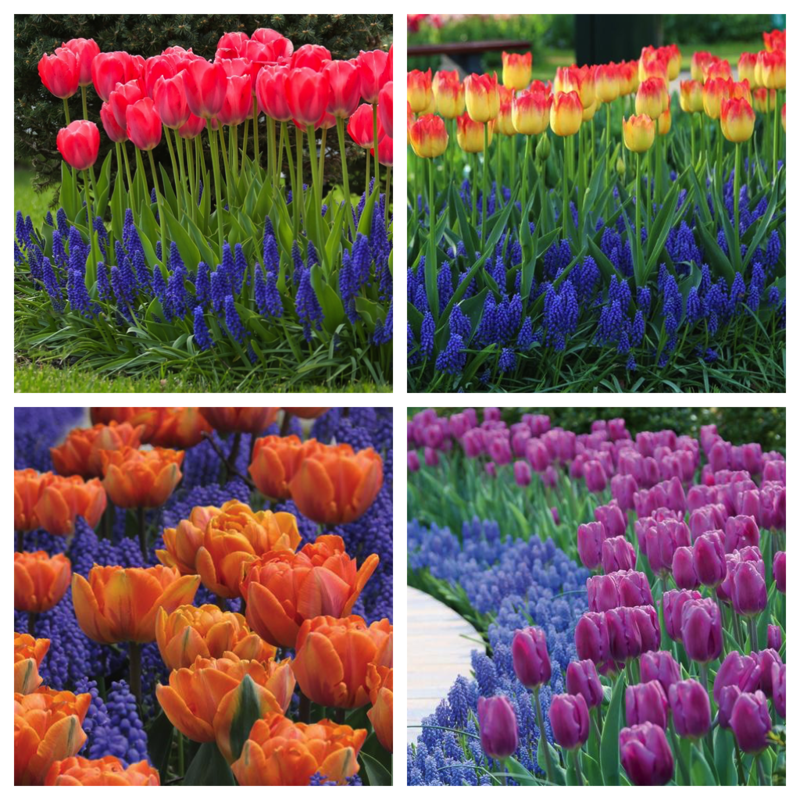 2) Plant your tulips or daffodils in the middle with muscari around all sides. This planting technique will ensure your spring garden looks good from every direction. 3) Interplant the bulbs on two layers. Plant tulips or daffodils first and cover them with about 2” of soil, leaving the tips exposed. Plant muscari bulbs on the next layer, in between the larger bulbs. Then fill the hole. The muscari will bloom in a carpet of blue beneath the taller bulbs.